HJ: The idea of the meridians are one of the few concepts that Western and Eastern medicine see eye to eye on. In Western terms, meridians are referred to as the nervous system, however, the name means little as the function of this biological network is ultimately what holds significance for us. Furthermore, the Eastern concept of the network of energy channels is far more refined, going even further in specificity and identifying microlines and temporal flows which are more subtle and etheric aspects of the larger nervous system/meridian framework. Either way you approach it, this network of nerve impulses is in large part responsible for our health and wellbeing, as it bridges both physical, mental and spiritual realities simultaneously. It is important to note that the power in the relationship between this triad — mind-body-spirit — lies in the spiritual realms and flows downward through the mental realm and ultimately into the body. The spiritual realm sets the conceptual framework of our existence and the mental realm translates into physical form, thoughts and events, which ultimately create the conditions in which the body exists, thereby exerting very real and palpable effects on it, all of which are manifested from the internal, outward, though ones perception may get lost in the illusion and experience things in the reverse order, but that is beyond the scope of this introduction. Blockages in the meridian system occur in response to this cascade of experience and are a normal part of life. They can be traced backward to help identify the original mental and spiritual reasons for the disruption in the first place, which is perhaps one of their biggest assets. This is possible because of the framework supplied to us through Eastern medicine detailing the relationships between the meridian system, emotions and their larger mental and spiritual origins/implications. For anyone truly interested in advanced levels of healing, understanding the energy flows in the body — the meridians, microlines and temporal flows — are a core concept. The meridians (the 72,000 Nadi) have been carefully investigated by Eastern traditions and even today are of interest to a major part of traditional medicine such as acupuncture, Shiatzu and chromo-puncture. They are energetic and bio-magnetic flows and by working on them it is possible to re-establish particular equilibriums that will stimulate certain faculties and help individuals achieve a state of harmony and health. Disease is basically interpreted as a problem in the body’s internal communications system. From this view point, using the correct instruments or massage, it is possible to ‘unblock’ certain channels of energy flows and encourage the re-establishment of natural correspondences between the subtle and the physical and thereby recuperate – and conserve –an optimum state of health. The Nadi are subtle inner pathways which are thought to be the conductors of the vital energy, Prana. The three most important Nadi are: Ida, Pingala and Sushumna. They are set out like a caduceus in as much as Sushumna is the centre channel while Ida and Pingala flow respectively to the right and left, crossing it at determined heights. Ida is connected with the feminine polarity while Pingala is connected to that of the masculine. Eastern traditions state that when meditators withdraw their attention from their surroundings and retreat inside the self, striving through psychic and physical practices to recover the mystery which lies within, reawaken the Kundalini, the cosmic potency sleeping inside those who have forgotten their true essence. This reawakening – which in certain circumstances can also happen spontaneously or be caused by particular circumstances (for example the phenomena of mysticism) and often eludes the comprehension or control of its protagonists – is usually accompanied by a blast of energetic heat and considered rather dangerous. There are many schools which prefer a more progressive and harmonious road to reawakening rather than a direct and vehement one, this permits the Kundalini to reawaken in a natural way so that the energy derived from it can be consciously managed. 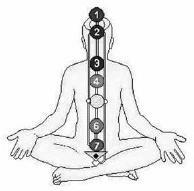 At various heights on the vertebral column we find the chakra, also defined as Padma (lotus), which supervise the body’s activities. 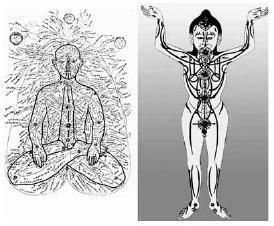 They function in relation to the body’s psychic sphere and in its universal processes and also in relation to the identity which exists between the microcosm/Mankind and the macrocosm/Universe. If however it is correctly controlled, Kundalini transforms the human body into a ‘divine body’. The tangible manifestations of such a process, appear to be the so called Siddhi, the ‘perfections’, or those supernatural powers realized by the human being that have full control over baser instincts. The microlines, whose position in the body is very different to that of the meridians, constitute a more subtle an essential network of flows of vital and spiritual energies and ‘interface’, as it were, our superior consciousness with the reality of events or with our current dimension. The microlines allow our subtle bodies to move according to their different needs. They form in the fourth month of pregnancy and can form and develop by means of their own inner faculties. The microlines flow on the body and in the body, both on the surface and at different depths and intensify in the hands, the ears and by correspondence in the eyes. Vital energies flow in the microlines first and are later processed by the chakra. Sometimes the microlines assume positions which are partly external in respect to physical posture, enough even to project themselves outside of the aura. They tend to arrange themselves harmonically in respect to the movement of the body and usually coordinate themselves by anticipating the physical movements of the body itself. Particular dances exist (think of all the sacred dances of the world from the tribal to the religious, from types of bio-dance to yoga, from the dances of the Sufi to the Tensegrity that Castaneda talks about) and specific techniques of ‘harmonization’ through which we can direct the circuits of the microlines to maintain, receive or exchange energy. We are talking about archetypical movements and positions of great importance that allow the centres of vital energy to be stimulated. The microlines do not position themselves on immovable tracks but modify their positions following a kind of (bio) rhythm that lasts around seventy days. It is also important to note that individual choices, above all those of a spiritual nature, can modify the subtle design of the person (and vice versa). The microlines are nourished by vital energy, so it is important to maintain a harmonious contact with life: eat naturally and healthily, live in contact with nature or regenerate every now and again in a natural environment, for example by taking a long walk in the woods. A healthy and natural life has much more value than meditation techniques (and medicine). Precise massage techniques also exist which can be practiced by pregnant women to promote the harmonious development of the subtle bodies of the unborn child. The microlines find a correspondence in the Synchronic Lines of the planet and are sensitive to the lines to which they are geographically closest. Just as with the Synchronic Lines, the microlines are divided into major and minor lines and microlines of different intensity can also be distinguished in the human body. The chakra constitute the nodes of the major microlines and correspond to the planetary synchronic nodes that can be imagined as the chakra of the Earth. If we want to draw parallels we could think of a standing stone which functions as a kind of acupuncture on the body of the planet. The microlines are closely related to the major Synchronic Lines: in theory by acting on the Synchronic Lines we can act by correspondence on somewhere else in the world: we create a correspondence in the people who live in that place by means of their microlines. We are talking about a rather complex level of alchemy which is currently being investigated by certain centres of power, ready to exploit its potential in order to control and manipulate the masses. But the opposite is also true: by working properly on oneself it is possible to produce changes on the planet at a synchronic level. In order to interact with the subtle and vital reality that surrounds us, we project our lines of force by means of thirty-three valves positioned in the aura which correspond with precise points on the subtle geometries that surround the physical body. These lines are perceived by magicians and shamans during their altered states of consciousness and are ‘seen’ as blue currents of energy that project in and from the body (as testified by various magicians during my stay in Cameroon). We can also say that we emit these lines of force from the ‘nodes’ of our microlines which then connect with the geometry of events. They create a sort of energetic cobweb, attracting or repelling energies, forces and thoughts that are more or less in tune with our nature and our will. In effect, by moving our ‘point of union’ (the assemblage point as Castaneda called it) we can create or give shape to the reality which surrounds us through our system of microlines and lines of force. Another system of currents known as temporal flows, is acknowledged by certain Eastern schools, although perhaps not in these terms. Through this particular system we are connected to the structure of time. Time is not a dimension linked to the world of material Form but develops its own ‘field’ and is governed by autonomous laws. It is a dimension with its own reason for being which regardless of the world of Form constitutes the indispensible ramifications of ‘support’ on which the material dimensions (space and Form) manifest. Time is a complex, intelligent and independent eco-system, we could even say ‘living’, with which the diverse possible manifestations of existence are in strict symbiosis. We ourselves are, more than anything else, all temporal beings and relate to time through a special connection: the temporal flows to be precise. The most important thing to remember is that by means of the temporal flows a ‘substance’ reaches us that is fundamental to our evolution: that substance is called thought. As is well explained in the Treatise on Living Thought by Massimo Scaligero, thought is not something that we produce through the dynamics of the mind but a substance in which we are immersed and that we are limited to processing only at our own level of awareness. There exists a strict correlation between the density of the temporal fabric and the quantity of accessible thought, furthermore our reality it is qualitively proportional to the quality of the thought substance that we ‘inhale’. However, this thought is also the target of programmes that condition our minds. A correct method of breathing is a useful procedure for the purification and detoxification of such conditioning. It is also a way to activate Prana channels and access a level of interaction with thought and the universal mind which is way above our current possibilities. By applying special massage or breathing techniques, we can balance and regulate the flow of thoughts that pass through us along the temporal body flows, notably improving the quality of our elaboration. This process reflects upon how we interpret ourselves and reality itself. Let’s not forget that in ancient civilizations, in particular that of Egypt, the different functions of thought were positioned in more than one part of the body, in particular, besides the brain, in the intestine and the heart. Many meditation techniques have been individuated to develop the capacity to process thought, from the use of lateral thinking to emotive intelligence, but the most important role is that played by Art. Art is the best instrument for the glorification of our talents and our creativity but most of all our ability to reawaken the intelligence of the body which is much more complete than that of the ‘rational’ mind.